If you own multiple properties, it can be a challenge to keep track of all the demands between your properties. Not to mention the challenge of expanding your property ownership business while keeping up with the demands of your existing properties. Twin Cities Real Estate Services are your trusted property management company in the Minneapolis area. We are dedicated to making sure your properties are fully taken care of, and that you can be confident that your properties are in good hands. This blog will give you insight as to what property managers do, and why it’s a good idea to hire a property management company to take care of your real estate investments. Property managers screen tenants before they are able to rent. This is a way to give you peace of mind that your tenants will pay rent on time, continue to rent your property for a long period of time, take care of your property, and not cause unnecessary problems. Property managers know how to identify red flags from the start and identify trustworthy and responsible applicants. Being able to spot warning signs takes time and experience that only experienced property managers have. Avoiding problematic tenants helps you avoid scams and lawsuits among other problems. Making sure your tenants are a good fit is an aspect of property management that should be taken seriously. Property managers serve your tenants. They are the point of contact when something happens, and will respond at any hour of the day so that you don’t have to. When you own property in different places, or multiple properties at once, it’s not always easy to be everywhere and do everything for all of your tenants all the time. Property managers take care of this, and make sure your life is stress-free. Property managers also make sure you are receiving consistent cash flow through rent each month. By hiring a property manager, you are removing yourself from the “bad guy” position, and allowing them to take over the responsibility of making sure your rent is paid. Sometimes this involves hearing excuses, nagging and chasing down people to pay the rent, and evictions when necessary. Any of these can be stressful and headache-inducing, so let the property manager do it for you. Property managers make sure every move that they make, and that you make, is within property laws, and you don’t end up with a lawsuit to deal with. Property managers are in charge of staying updated on the needs of your property so that you don’t have to. Keeping the property updated and making the necessary repairs is part of keeping your property valuable and marketable. 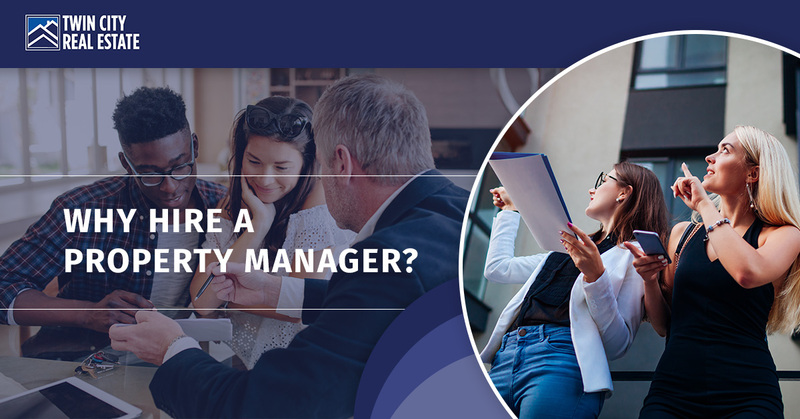 Part of the property manager’s job is to know what the property needs, to communicate with you (the property owner) about it, and take steps to keep the property in a valuable position. Twin City Real Estate Services offer the highest quality property management services to our clients. We work hard to provide a comprehensive number of property management services that cover all of your needs. If you want to learn more, give us a call today.